are five years when only a single individual was banded. This was the first for 2014. Notes: Just 8 weeks ago we concluded our record-breaking tenth Spring Migration Monitoring Program – and already the fall equivalent is underway again! Such is the nature of migration in southern Quebec, where in fact some species (primarily shorebirds) have already been heading back south for several weeks. However, our traditional start date of August 1 is early enough for us to be monitoring the first of the songbird migrants, among them Tennessee and Yellow Warblers. 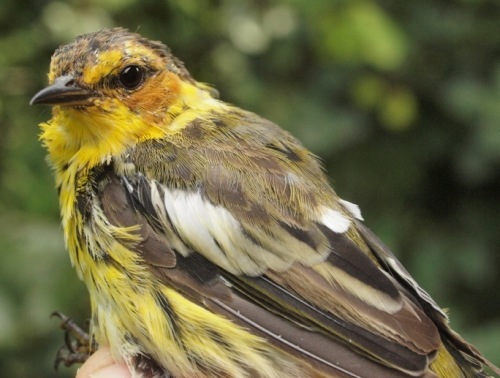 Some parts of Quebec (especially the Saguenay region) had remarkable numbers of breeing Cape May Warblers this summer, a reflection of the province's spruce budworm outbreak. The adult (very likely second-year) male above marks the first time we have had this species at MBO as a molt migrant. 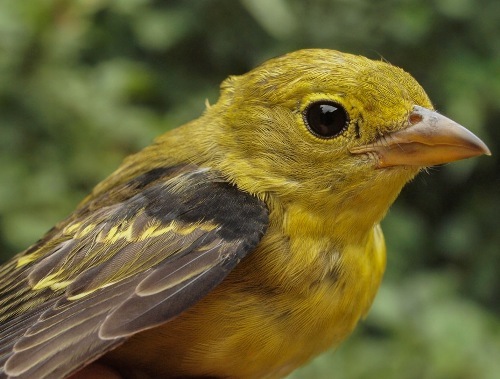 More often, the Cape May Warblers banded at MBO are hatch-year birds, like the one below also banded this week. Since 2009, the number of birds banded in the first week of fall has increased every year, from 228 that year to 300 in 2013. However, that pattern came to an end this year, with a modest total of only 202 for the week. Perhaps not coincidentally, we also had our lowest first-week count of Song Sparrows since 2009. 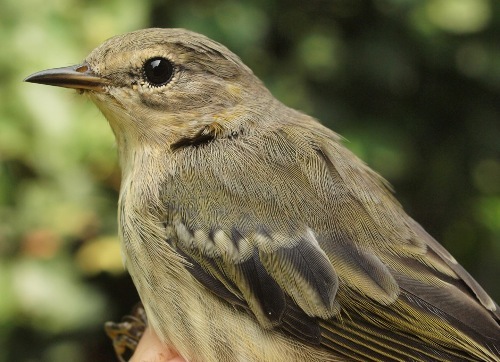 It isn’t that birds were not on the move though – the 78 species observed over the course of the week was well above average, and only behind the 84 recorded at this time last year. Among these were our first Pied-billed Grebe and Black-crowned Night Heron sightings of 2014. 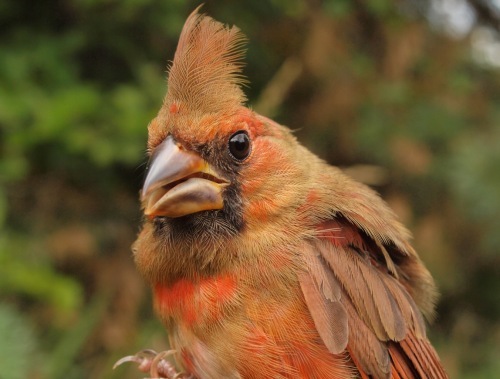 Meanwhile the 42 species banded is a record high for week 1 of the fall season, and included four species new for the year – Yellow-shafted Flicker, Scarlet Tanager, Indigo Bunting, and House Finch. The number of American Redstarts banded at MBO in fall increased for five years in a row from 2007-2011, and has since stabilized at under just 150 annually. They have also been arriving ever earlier … over the course of our first five years, they only twice appeared in the top ten in week 1, peaking in early September. However, over the past four years they have routinely been in the top five – and this year took top spot for the first time, narrowly edging out Song Sparrow, which has been dominant in six of nine previous years. The other three years, the top ranking was occupied by Yellow Warbler, which was rather scarce this week, in a four-way tie for seventh place with Northern Waterthrush, Tennessee Warbler, and Rose-breasted Grosbeak. While we often band a decent number of Gray Catbirds at the start of fall, the 18 this week substantially eclipsed the previous record of 13 set last year. Similarly, our previous high for Red-eyed Vireos in week 1 was 13 (in 2012), and we raised the bar this week. Rounding out the middle of the top ten were Black-capped Chickadee and American Robin, both representing the typical catch of local juveniles. The dominant species observed in week 1 have varied considerably over the years, with top spot variably occupied by American Crow (2012), Cedar Waxwing (2010, 2013), Song Sparrow (2005), Red-winged Blackbird (2006, 2007, 2011), Common Grackle (2009), and American Goldfinch (2008) … now joined by American Robin for 2014. All of the other regulars were in this year’s top ten as well, although Black-capped Chickadees dominated enough to sneak in as the runner-up ahead of them. The other interlopers in the list were Blue Jay (an unusually high count for this early in fall), and American Redstart, reflecting the surge in numbers banded. 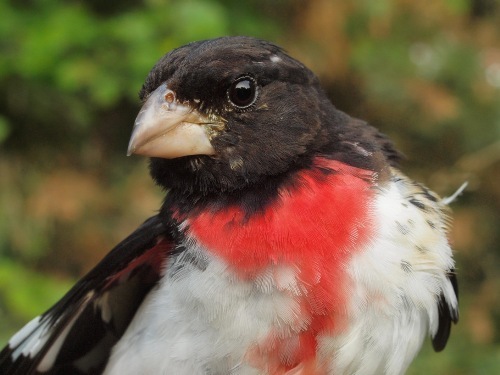 Rose-breasted Grosbeaks are often among the key species at MBO in early August. Our tenth fall season has just begun! We look forward to the next 12 weeks and sharing our results as the season progresses. Be sure to also check out our Facebook page for live updates and additional photo highlights throughout the season. Juvenile Northern Cardinals are a regular sight at MBO in early fall. 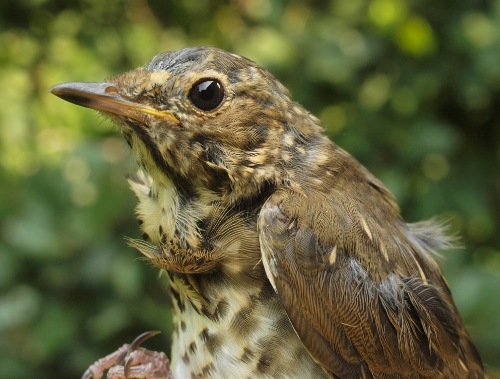 We often see a few adult Swainson's Thrushes at MBO in early August as molt migrants, but it's more unusual to see a very young juvenile such as this.